TORONTO, ON / ACCESSWIRE / December 7, 2018 / Eskay Mining Corp. ("Eskay" or the "Company") (TSX-V: ESK) (OTC PINK: ESKYF) (FRA: KN7; WKN: A0YDPM) is pleased to report the latest assay results and preliminary interpretations from the 2018 SIB property drill campaign. One highlight is that broad intervals of encouraging Volcanogenic Massive Sulphide (VMS) feeder-style mineralization were intercepted in two holes collared in the hangingwall of the Coulter Creek Thrust Fault (CCTF; figs 1-4). One of the holes, EK18-160, intersected 61.9 g/t gold and 8.9 g/t silver over 1.0 m within a 109.25 m interval grading 0.24 g/t gold, 3.6 g/t silver, 0.15% lead and 0.18% zinc, excluding the above-mentioned high-grade zone. 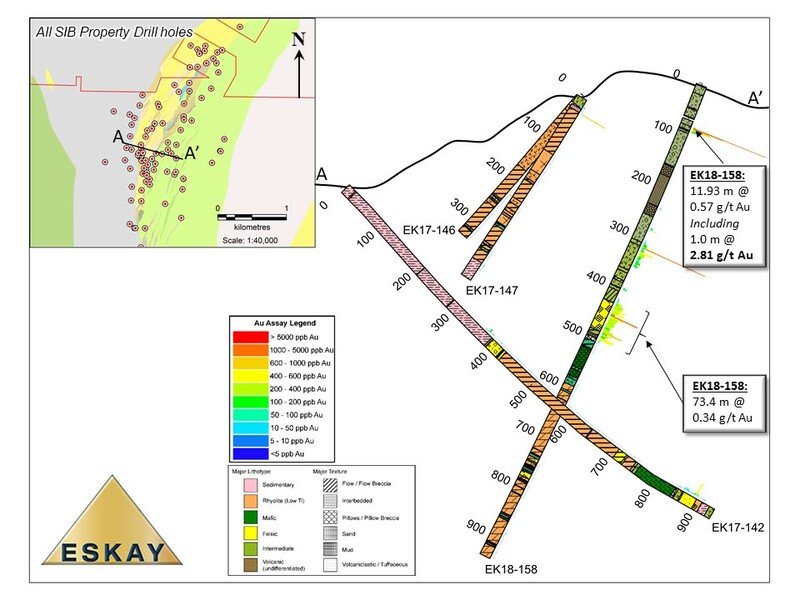 Another hole, EK18-158, located 2.5 km south of EK18-160, cut several zones of gold mineralization, including an 11.93 m interval of elevated precious and base metals that included a 1.0 m interval of 2.81 g/t gold, 2.7 g/t silver, 0.10% lead and 0.11% zinc, and a 73.4 m interval grading 0.34 g/t gold. Within the footwall of the CCTF, hole EK18-157 intersected sporadic gold mineralization over a 48 m wide zone (not fully sampled) which yielded anomalous gold geochemistry where sampled, and which graded up to 0.61 g/t Au. In this hole, the gold mineralization is hosted within rhyolite that is indistinguishable texturally and geochemically from that at the Eskay Creek mine, only 6 km distant to the north. Also of note is that hole EK18-157 represents the southwestern-most extent of drilling in the CCTF footwall. 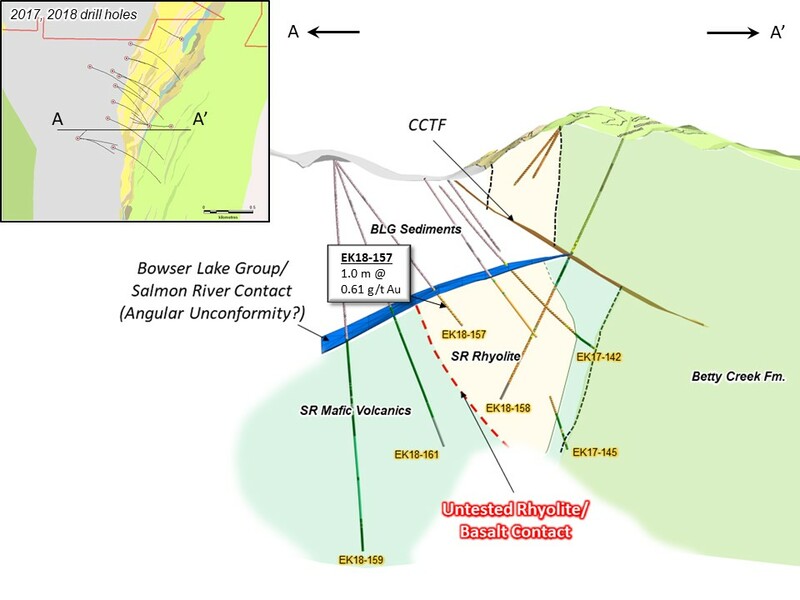 This suggests to the Company that exploration potential beneath Bowser Lake Group cover rocks in the footwall of the fault does indeed exist in this area, where favourable Eskay Rift stratigraphy remains untested, open to the south, and is well within reach of diamond drills. See Table 1 for drill highlights. The 2018 drill campaign, fully funded by SSR Mining Inc. ("SSR Mining"), was designed to test for precious metals enriched VMS mineralization primarily in the footwall of the CCTF. The 2018 drill program consisted of 11 holes, including extensions of EK17-150 and -151 drilled in 2017 (See Table 2).Drilling reaffirmed our assertion that potential remains in the both hangingwall and footwall of the CCTF, and it expanded our understanding of the geometry of Eskay Creek-equivalent stratigraphy in the CCTF footwall. (See Figure 1). The Company is thankful to SSR Mining for its participation in exploration at SIB, and it looks forward to continuing that exploration by leveraging the knowledge and understanding gained in the programs funded by SSR Mining. Eskay is grateful to be able to maintain its 80 percent ownership share in the property along with minority partner Kirkland Lake Gold. Four holes were collared and drilled east to west in the hangingwall block of the CCTF (Figure 1).Two of the holes (EK18-158 and EK18-160), located 2.5 km apart, intersected broad zones of semi-massive pyrite, chalcopyrite, galena and sphalerite veins within silicified volcanic rocks of the Betty Creek formation (See Figures 2 and 3 for cross-sections, and Table 1 above for results). EK18-160, in the Northern SIB enclave block, returned the highest gold grades of discordant, VMS "feeder-style" mineralization ever drilled on the SIB property. Areas up-stratigraphy have been explored by wide-spaced shallow drilling but remain untested for up to 200 m up-dip, and for approximately 850 m along strike (total length of the enclave claim block); this represents an area that is open for further exploration drilling. 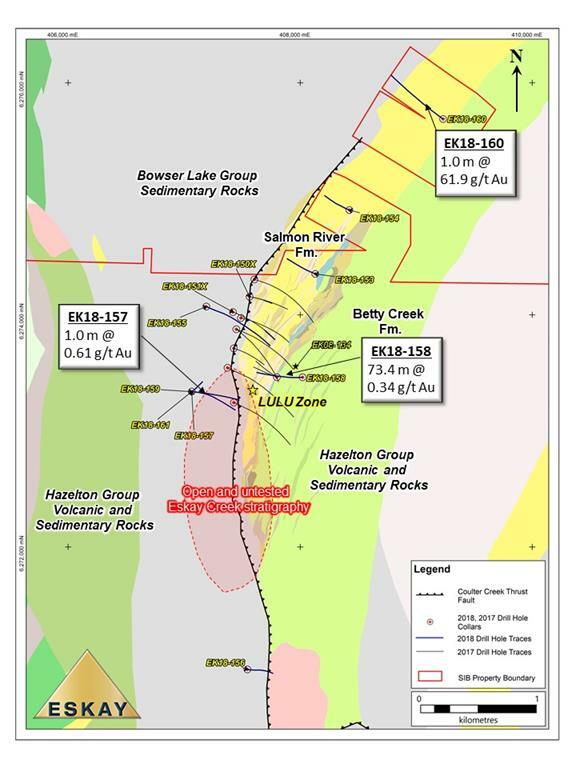 EK18-158 encountered several broad zones of anomalous gold mineralization in the hangingwall of the CCTF, including a 73.6 m wide intercept within silicified intermediate to felsic volcanic rocks that returned 0.34 g/t gold. EK08-134, located about 150 m north of EK18-158, encountered similar alteration and mineralization at the same stratigraphic level and returned 2.19 g/t gold over 20.20 m. We interpret these mineralized zones to represent VMS feeder systems, which remain largely untested in areas up-stratigraphy and along strike; it represents another highly prospective target. Six drill holes were collared in the footwall of the CCTF in 2018, and similar to the 10 holes drilled in the same area in the 2017 SIB program, typically drilled blind through as much as 450 meters of Bowser Lake Group cover rocks. In the geology beneath the cover, the holes revealed complex relationships among basaltic pillowed flows and rhyolite flows and flow-domes of the Salmon River formation. These relationships are in part manifest as abrupt along-strike thickness changes (e.g., cross-section shown in Figure 4) that are interpreted to represent significant syn-volcanic tectonism coincident with active subsea volcanism. Such apparently active extensional faulting and microbasin development in a sea-floor environment is considered essential to the formation and preservation of massive sulfide deposits. This is particularly significant given that the host rocks are essentially indistinguishable geochemically and lithologically from the distinctive rocks which host the orebodies at the Eskay Creek mine. Importantly, given our new understanding of the geology, the steeply easterly dipping lithological contact between basalt and rhyolite, which hosts the orebodies at the Eskay Creek deposit, remains untested to the south. The southernmost hole drilled during the 2018 SIB program (EK18-157) intersected a 48 m wide zone (between 614.2 and 662.2 m) of intermittent intervals containing elevated gold within silicified tuffaceous and flow-banded rhyolite. It is the Company’s view that significant exploration potential remains in the CCTF footwall, particularly southward from the area drilled in 2017 and 2018, from which it is now inferred that the prospective rhyolite package appears to be thickening. The favourable Eskay stratigraphy remains open and untested to the south, well within reach of diamond drilling. CEO Mac Balkam commented: "The 2017 and 2018 drilling programs led to the development of a new and well-constrained view of the Eskay rift geology in the footwall of the CCTF. This work has led to significant refinements in the search for prospective precious metals-enriched VMS horizons at the rhyolite-basalt contact, which hosts the truly world class orebodies mined at Eskay Creek. 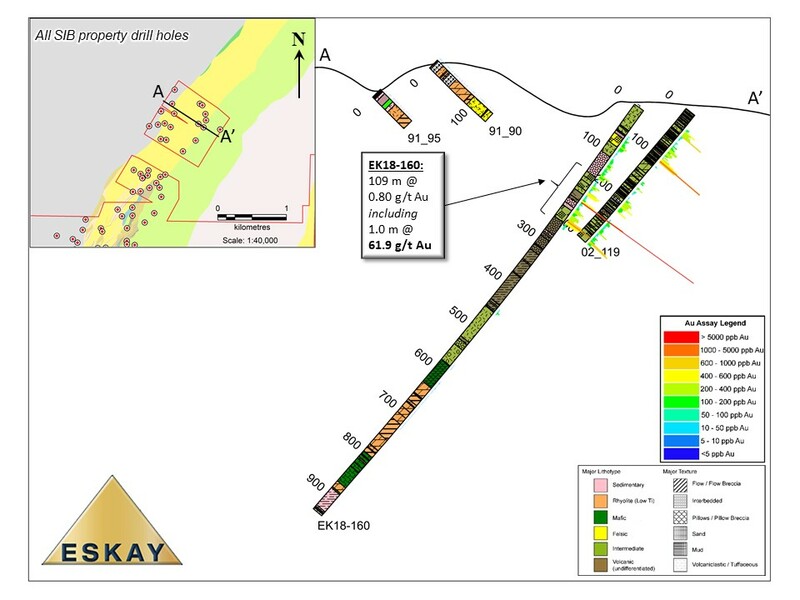 Drilling has outlined a thickening rhyolite package stepping south and west, and the prospective Eskay-like stratigraphy, which bears a remarkable resemblance to that at the Eskay mine, is primed for further exploration to the south. Due to our improved understanding of the complex geology, we are in a better position to make a significant discovery on the SIB Property." In summary, the 2018 drilling season at SIB was a success. It confirmed that the highly prospective conceptual stratigraphic target existed within the footwall of the CCTF, was reachable with the diamond drill and was mineralized. In addition, in discovering new gold mineralization within the hangingwall of the CCTF, the Company has shown that even the northern part of the SIB property retains its excellent exploration potential. For further information regarding the SIB property, see the Company’s Press Releases of October 17, 2016, August 8, 2016, May 9, 2016 and January 22, 2018. For further information regarding Eskay’s prospects and showings at the Corey property, see the Company’s corporate presentation entitled "April 2018 Property Review and Targeting". All geochemical samples were delivered directly to ALS Global’s analytical facility in Terrace, B.C. for preparation, and subsequent precious metal and multi-element analysis in their North Vancouver laboratory. ALS Global in North Vancouver, British Columbia, Canada, is a facility certified as ISO 9001:2008 and accredited to ISO / IEC 17025:2005 from the Standards Council of Canada.